Here’s a prediction: the new emphasis on artificial intelligence and robotics will occasion some new looks at knowledge representation. Prior to the past few years many knowledge representation (KR) projects have been more in the way of prototypes or games. But, now that we are seeing real robotics and knowledge-based AI activities take off, some of the prior warts and problems of leading KR approaches are starting to become evident. Since the mid-1980s, description logics have also tended to govern most KR languages, and are the basis of the semantic Web data model and languages of RDF and OWL. (However, common logic and its dialects are also used as a more complete representation of first-order logic.) The trade-off in KR language design is one of expressiveness versus complexity. Cyc was developed as one means to address a gap in standard KR approaches: how to capture and model common sense. Conceptual graphs, formally a part of common logic, were developed to handle n-ary relationships and the questions of sign processes (semiosis), fallibility and processes of pragmatic learning. Zhou offers a new take on an old strategy to KR, which is to use set theory as the underlying formalism . This first paper deals with the representation itself; a later paper is planned on reasoning. We do not live in a dichotomous world. And, I personally find Charles Peirce’s semeiosis to be a more compelling grounding for what a KR design should look like. But as Zhou points out, and is evident in current AI advances, robotics and the need for efficient, effective reasoning are testing today’s standards in knowledge representation as never before. I suspect we are in for a period of ferment and innovation as we work to get our KR languages up to task. Yi Zhou, 2016. 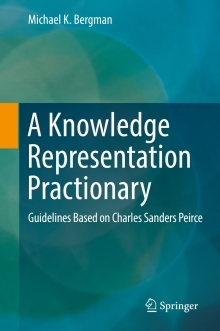 “A Set Theoretic Approach for Knowledge Representation: the Representation Part,” arXiv:1603.03511, 14 Mar 2016. Current advances in robotics and AI -- which are placing a premium on efficient, effective reasoning -- are testing today's standards in knowledge representation. I suspect we are in for a period of ferment and innovation as we work to get our KR languages up to task. Zhou's paper provides one alternative based on set theoretics.